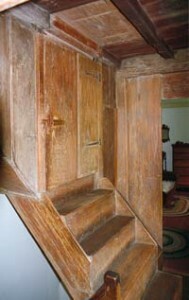 On the second floor level, a door conceals the stairs to the attic or garret. The attic would have provided sleeping quarters for the slaves and/or hired servants of Jason Russell. In addition, drying foodstuffs, such as corn and beans would have been stored there over the long winter months. To the right of the stairs there is a “secret closet” with a sliding door, used to hide important documents and valuables.